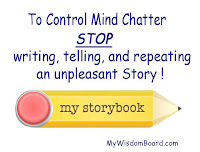 My Wisdom Board Blog : Mind Chatter . . . The Ultimate Story-Teller ! Mind Chatter . . . The Ultimate Story-Teller ! I – Spirit – must take charge of the mind. I must speak to the Mind . . . not from the Mind ! You are NOT the Boss of us . . . I am in Charge of us ! ‘I see what you are doing’ ! You are incessantly writing, telling, and repeating unpleasant and untrue stories. un-necessary and harmful to us. It is out of alignment with our Higher Self . . . and I Intent to bring us into Alignment with each other! You derail my Intentions . . . instead of supporting them ! You always tell me what’s wrong . . . rather than what’s right . . .
How the world is against us . . . not for us . . .
What’s not working . . . instead of what’s working ! Why it won’t happen . . . how I’m not good enough . . . or why I’m not worthy ! ‘I see what you are doing’ ! Your protection is un-necessary and harmful; and I intent to take charge of you. I must . . . and I intent to learn to separate myself from my Mind Chatter ! I Ask myself regularly: Is this true . . . or am I telling a story ? What is the ’verifiable’ evidence???? If it is a story . . . I intentionally and deliberately take away its energy, its power . . . by removing my attention from the story and giving my attention to something else . . . something more pleasant . . . i.e. I intentionally and deliberately train myself to stop the false ‘story-telling’ by distracting myself ! I intentionally practice this every day as I go through my day . . . as I catch my mind telling its stories ! 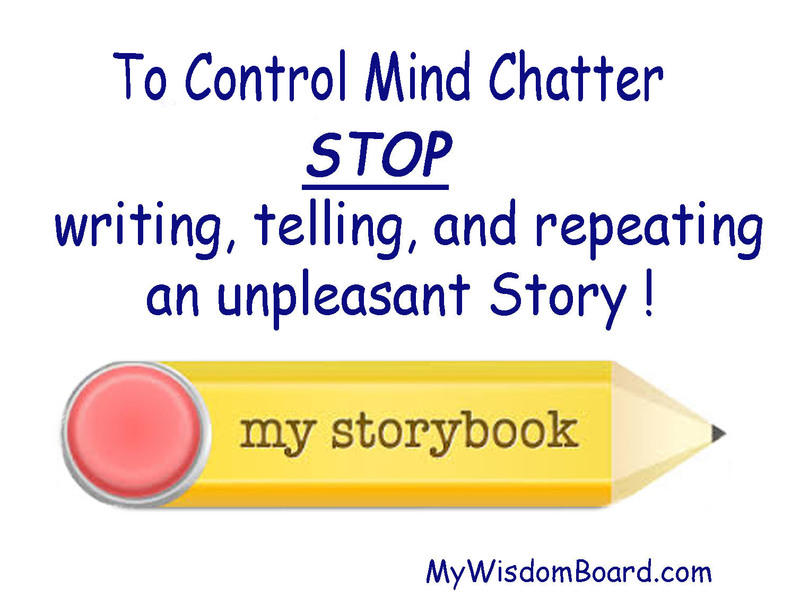 For more details visit MyWisdomBoard's 'Mind Chatter' page. My mind chatter is a secret? Only you know. It wants to stay undetected . . . or 'secret' . . . so it can keep telling its stories and exert its 'secret' power over us. But we must learn to recognize it and stop listening to it if we want to be free from its 'secret' destruction.